Devoid Of Culture And Indifferent To The Arts: Foraging 9, Gardening & Recipe: You’re not leaving this table until you eat all your ground cover. Foraging 9, Gardening & Recipe: You’re not leaving this table until you eat all your ground cover. Cornus canadensis, a member of the Dogwood family, is like no other dogwood. You see, it only grows to between 5-8” tall. If you look closely you can see the family resemblance. The leaves look exactly like other members of the family. You’ve seen this dogwood a thousand times. They make a beautiful green, white flowering carpet almost everywhere through our forests. They can also be grown at home for their beauty, and also used as a food source. Bunchbery grows everywhere in our forests. Cornus canadensis is native to the northern regions of China, eastern Russia, Japan and North America in coniferous forests. It grows along the margins of woods, on old tree stumps, and in mossy habitats that will supply its requirement of cool, moist soil. It makes a beautiful natural ground cover in shady woodland areas. 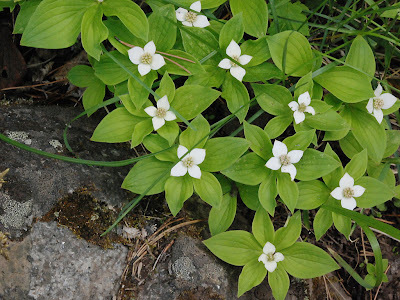 The most common name for it is Bunchberry, but it also goes by some other colourful names such as pigeonberry, squirrelberry and crackerberry. I’ve read of two reasons for the last name, the first being because of the snapping sound made when the fruit is popped, the other that it comes from an old word for crow (crake). As you can tell, with all the alternate names it is evidently a favorite of wildlife. In New England bunchberries (aka puddingberries) were added to other fruits in puddings for additional color and also for their high pectin level to help the puddings set up without additional thickening agents. For this same reason they were also added to jams and jellies. A prolific northern woodland ground cover, it spreads by underground runners and seeds and will do very well if you meet its growing conditions. Bunchberry requires acidic, moist soil and lots of shade with a little morning or afternoon sunlight as they are extremely heat sensitive. 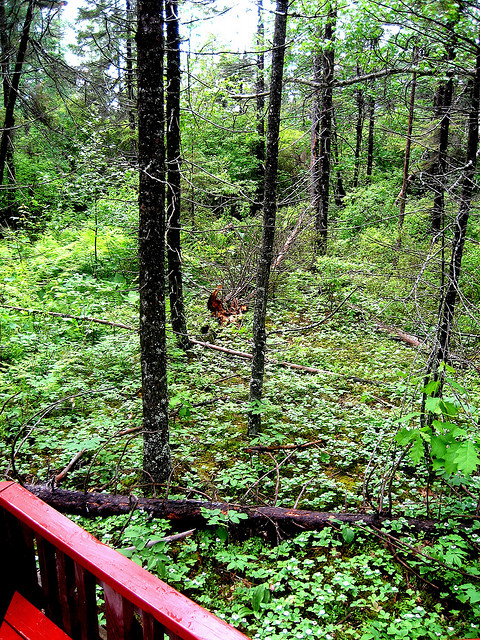 If you wish to add some bunchberry to your property, you may have a little prep to do beforehand. To make your soil more bunchberry friendly, dig old wood and pine needles into the soil. Then top dress with more pine needles. 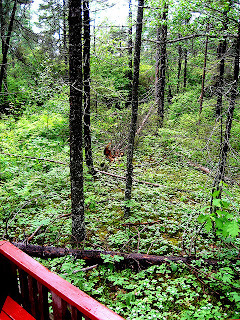 The decaying wood gives the organic matter that bunchberry requires and pine needles increase the acidity of the soil. Try pine needles around your rhododendrons for the same purpose. Don’t forget to add wood chips and pine needles every few years to your bunchberries to keep the soil in proper condition. Bunchberry’s white flowers turn into clusters of pea-sized red fruits. In actuality what you see as a single flower is made up of many tiny flowers surrounded by four larger white bracts. 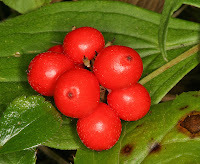 This is how the “single flower” fruits into several berries. Each berry has a hard large seed. Botanically, the fruits are actually drupes, which is fruit with a “stone” such as apricots, peaches, etc. The berries are edible but somewhat bland. Some say they taste mildly of apple. Regardless, bunchberries are among the best berries for inclusion in homemade jelly and an excellent addition for with other sweeter berries that would need pectin added to set up. Bunchberry recipes are few and far between, most likely lost in the mist of time and due to the availability of Certo®. But I did find one that sounds very interesting. It uses the pectin in the bunchberries for thickener. I’ve assembled three recipes here that would make a delicious dessert. Fruit syrup, crepes and lemon ricotta filling. If you’ve never made crêpes, they’re easier than pancakes, and definitely a skill you should learn. Crêpes can be used for both sweet and savoury dishes. 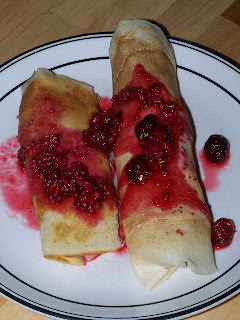 Just make the crêpes, stuff with the filling (either by rolling or folding into triangles), and drizzle with the syrup. Top with fresh raspberries if desired. Place the fruit in small saucepan with the water and honey. Bring to a boil and cook until soft, about 10 minutes. Press the cooked fruit through colander or food mill. Use on pancakes or crepes and store remainder in a jar in the refrigerator. Crepes are a breeze to make. Cook the crêpe for about 2 minutes, until the bottom is light brown. Loosen with a spatula, turn and cook the other side. Can be served warm (best) or chilled until ready to use. If chilling, separate with saran wrap or they may stick together. Use the sugar to your individual taste. Beat together all ingredients and chill until ready to use.